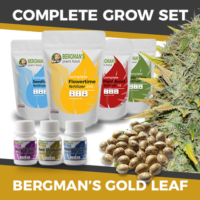 The wait for an automatic version of the best selling Robert Bergman creation is finally over with the release of Gold Leaf Autoflower seeds. 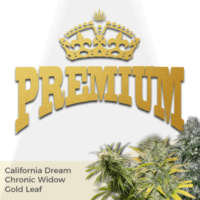 Created using the same genetics as the highly popular feminized variety, these special little seeds are the perfect choice for all levels of experience, and require no set hours of regular darkness to commence, and complete, their flowering cycle. 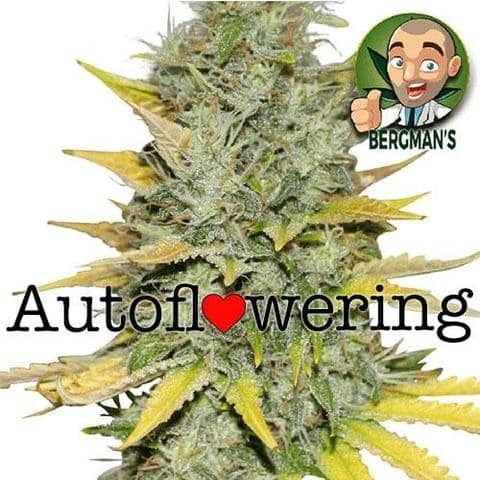 Autoflowering seeds are the perfect choice to plant outdoors. Unlike conventional feminized marijuana seeds, which require an average of 12 hours of uninterrupted daily hours of darkness to flower through to complete maturity, auto seeds begin to produce small white ‘hairs’ almost as soon as they have sprouted, growing and flowering simultaneously, through until maturity. 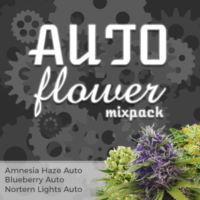 Their ability to grow, flower and mature under any light regime, makes Gold Leaf Autoflower seeds a great choice for outdoor growers looking to produce an early harvest. Traditionally, growing marijuana seeds outdoors would be split into two distinct phases. The vegetative phase – From Spring through to Summer when the daylight hours are at their longest. The flowering phase – From late Summer through to early Fall when the daylight hours are reducing daily below 12 hours per day. Planting Gold Leaf Autoflower seeds during the early part of Spring however, will produce plants that are capable of growing and completely maturing in approximately 56 days from sprouting, regardless of the number of hours of daily sunlight the plants receive, in fact, the longest and stronger the sunlight is, the larger the plants and buds will become. All Gold Leaf Autoflower seeds are completely feminized, ensuring every seed you germinate will result in a pure female plant. With no need for sexing, or the reduction of light hours to induce flowering, these are the perfect seeds for beginner growers looking to generate a fast, cheap crop. With a combined short growing and flowering cycle, yields are reduced to between 4 -6 ounces per plant when grown outdoors, while indoor growers can achieve between 4 – 6 ounces per square meter. THC levels remain consistent with the feminized strain however, at 21% and the high CBD content, makes it a great choice for both recreational and medical marijuana users alike. Blending 60% Indica and 40% Sativa genes, the high is complex, combining feelings of euphoria and happiness, with creativity and energy, suitable for both day and night-time, socializing or relaxing. Enjoy a ‘full-bodied’, rich smoke with an earthy-pine aroma and sweet, diesel-like flavor. 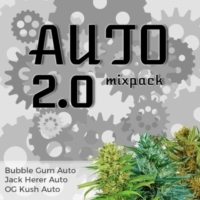 You can buy Gold Leaf Autoflower seeds in complete packs of 5, 10 or 20 feminized marijuana seeds and enjoy large discounts on bigger pack sizes. All sold with guaranteed, free postage and packing, shipped directly by I Love Growing Marijuana, one of the world’s leading producers and suppliers of high quality cannabis and marijuana seeds. Fast, automatic flowering strain, producing large yields of dense, sticky buds. High THC levels of approximately 12%, together with a high CBD content produce a fast-acting, euphoric high that’s uplifting, creative and energizing. Dense plant that’s easy to grow both indoors and outside during the Summer season. High levels of CBD and an energizing high make this a perfect strain for medical users. The almost immediate effects relax and invigorate both the mind and body.